A section of the San Andreas Fault on the Carrizo Plain in California. Over the past four decades, geoscientists have recorded thousands of small earthquakes in California’s San Bernardino basin near the San Andreas and San Jacinto faults. New research published in Geophysical Research Letters suggests many of these quakes, some of which occur at depths between 6 and 12 miles (10 and 20 kilometers), are exhibiting surprising deformation patterns. Instead of slipping in a horizontal manner, many of these earthquakes show vertical movement far below the surface. Illustration depicting anomalous earthquakes—the deep creep—near the San Andreas and San Jacinto faults in southern California. This previously undetected movement, dubbed “deep creep,” suggests things aren’t happening beneath the San Andreas and San Jacinto faults in the ways we think they are. And that’s a problem, given the history of the region. Regions along these major faults are vulnerable to damaging earthquakes, the most recent being the 1989 Loma Prieta quake (in the Santa Cruz Mountains south of the Bay area), which registered a magnitude 6.9, killed over 60 people, and caused upward of $6 billion in damages. Surprisingly, one-third of all small earthquakes detected in the region since 1982 are of the deep creep variety, according to the authors of the new study, geoscientists Michele Cooke and Jennifer Beyer from the University of Massachusetts Amherst. These enigmatic slips are mostly occurring to the northeast of the San Jacinto Fault, and primarily below depths of 6 miles. This strange behavior, the authors say, was completely missed by scientists, the impacts of which now need to be determined. “These little earthquakes are a really rich data set to work with, and going forward if we pay more attention than we have in the past to the details they are telling us, we can learn more about active fault behavior that will help us better understand the loading [the buildup of seismic pressure] that leads up to large damaging earthquakes,” said Cooke in a statement. The deep creep earthquakes analyzed by Cooke and Beyer occur beside and between the two primary faults, and they produce distinctive deformations compared the ones produced by the large, ground-rupturing variety. 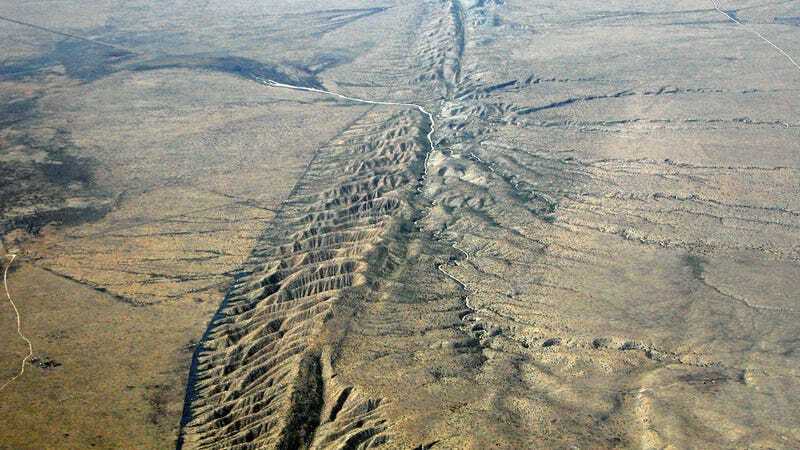 The San Andreas and San Jacinto faults are strike-slip faults, and their movement can be compared to two blocks sliding horizontally past one another. The motion of the deep creep slips are noticeably different, with one block pulling away from the other at an angle—a wave-like movement that extends the fault. These anomalous slip-sense faults, as they’re called, only seem to occur in one small area, and the researchers were at a loss to explain why. Normally, geoscientists use GPS to detect and measure seismic slips, where the location between GPS stations on each side of the fault shift in the wake of an earthquake. In this case, however, GPS could not be used because the smaller faults are too close together. So, to figure out what was going on deep below, Cooke did what any good scientist would: She built a 3D model. Or more specifically, a computer simulation that does 3D fault modeling. The findings of this study demonstrate that small earthquakes that occur adjacent to and between faults can have very different style of deformation than the large ground rupturing earthquakes produced along active faults. This means that scientists should not use the information recorded by these small earthquakes in the San Bernardino basin to predict loading of the nearby San Andreas and San Jacinto faults. Speaking to Newsweek, John Vidale, director of the the Southern California Earthquake Center, said the study was “quite well founded,” and certain specialists may be “sad to see the interpretability of their models undercut.” However, Vidale said the study’s implications were “profoundly ambiguous,” and that Cooke and Beyer failed to flag anything particularly dangerous that experts haven’t identified before. That said, it’s kinda scary for these researchers to find a previously undocumented process happening in this area. Ultimately, however, this is good news. Armed with this knowledge, scientists can now study these deep creeps further to improve our understanding of this seismically tumultuous region of California. Correction: An earlier version of this article misstated the location of the 1989 Loma Prieta quake.